A sign of the Office of the Attorney General is displayed on the Department of Justice building the day after Special Counsel Robert Mueller delivered his report into Russia's role in the 2016 U.S. election. Special counsel Robert Mueller's investigation found no evidence President Donald Trump, his campaign or associates conspired or coordinated with Russia to interfere in the 2016 presidential election, according to a summary released Sunday by Attorney General William Barr. On the issue of obstruction of justice by Trump, Mueller's report "does not conclude that the president committed a crime, it also does not exonerate him," Barr said in his summary. Mueller spent 22 months looking into whether Trump's campaign colluded with the Russians and if the president obstructed justice by trying to stop the investigation. 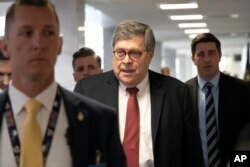 FILE - Since confirmed Attorney General nominee Bill Barr arrives for a meeting on Capitol Hill in Washington, Jan. 26, 2019. Key lawmakers, opposition Democrats and some of Trump's Republican allies, have all called for release of the full report, but it is not clear whether Barr will do so. Trump said last week he did not object to the full release to the public but also has said it is up to Barr, whom he appointed as the country's top law enforcement official, to decide how much of it is disclosed. White House aides say Trump has not been briefed on the outcome of Mueller's investigation, a probe that has clouded almost the entirety of his 26-month presidency. The U.S. leader has dozens of times derided Mueller's investigation as unwarranted and a "witch hunt," while rejecting accusations that he colluded with Russia or that he tried to thwart the probe. He is spending the weekend at his Atlantic oceanfront retreat Mar-a-Lago in Florida, playing golf, and uncharacteristically not commenting on Twitter about Mueller. On Sunday, he tweeted, "Good Morning, Have A Great Day!" The Democratic heads of six House committees wrote a joint letter to Barr Friday, saying, "If the Special Counsel has reason to believe that the president has engaged in criminal or other serious misconduct, then the Justice Department has an obligation not to conceal such information. The president must be subject to accountability."